Years after enormous monsters overran the planet, a colony of spacefaring humans returns to take back Earth from Godzilla. Aboard the spacefaring vessel Aratrum, Captain Haruo Sakaki demands that the colonization ship leave Planet Tau-e’s orbit and abandon its emigration project. Haruo accuses the Central Committee, Aratrum’s governing body, of sending elderly survivors to die on an uninhabitable planet so there are less mouths to feed. Haruo threatens to blow up his transport shuttle if the ship doesn’t change course. Tired of wandering space, colonization volunteer Daichi Tani, who is also Haruo’s grandfather, convinces Haruo that they want to go to Tau-e. Haruo surrenders and is taken into custody. Haruo watches in horror as the transport shuttle explodes over Tau-e, killing everyone aboard in an apparent accident. Haruo recalls how giant monsters overran Earth in 1999. During the decades-long war against Godzilla, humanoid aliens known as The Exif offered humanity salvation in exchange for devotion to their religion. Another alien race, the Bilusaludo, also came to Earth after their home world in the Bilusaludia Binary System was swallowed by a black hole. In exchange for sanctuary, the Bilusaludo promised to eradicate Godzilla. However, their Mecha-Godzilla creation failed to activate, forcing humans, Exif, and Bilusaludo to evacuate the planet in 2048 aboard the Aratrum. Haruo witnessed Godzilla destroying the transport carrying his parents. After 22 years without a home, survivors are increasingly despondent and resources are severely depleted. Exif archbishop Metphies secretly helps Haruo access data on Godzilla. Convinced that there must be a way to destroy Godzilla and take back Earth, Haruo devises a theoretical strategy to defeat the monster using science and military force. Metphies anonymously publishes Haruo’s findings, sparking rumors among the population and discourse among the officials. After reasoning that the likelihood of finding another habitable planet is low, the Central Committee considers Haruo’s proposal. Metphies convinces officials to drop charges regarding the stolen secret information in exchange for revealing that Haruo wrote the analysis. The committee hesitantly agrees to enact Haruo’s plan for returning to Earth to confront Godzilla. Haruo assembles a team of 600 people to enact his strategy. Upon arriving on Earth, everyone is shocked to find that, due to different calculations in their space travel time, nearly 20,000 years have passed since Godzilla took over Earth. Impossibly, Godzilla appears to still reign supreme. Captain Elliot Leland commands the Earth Landing Brigade. Other notable team members include Lt. Colonel Galu-gu, Prof. Martin Lazzari, and 2nd Lt. Adam Bindewald. Galu-gu’s engineering team sets down in Tanzawa Pass to lay a trap for Godzilla while Leland, Haruo, and Metphies plot to draw out the creature. Master Sergeant Yuko Tani is assigned as Haruo’s handler since Haruo is still on probation. Yuko asks if Haruo thinks the Central Committee intentionally sabotaged the Tau-e shuttle to exterminate elderly colonists. Haruo responds that the committee couldn’t be that corrupt. Winged monsters attack one of the camps. Realizing that flora and fauna have grown toxic, Leland proposes retreating since even if they could defeat Godzilla, only the air pressure and gravity make the transformed Earth a desirable habitat. Haruo angrily confronts Leland for apparent cowardice. Metphies points out that the monster attack destroyed four transports, meaning they cannot retreat without first rejoining the other units. Metphies proposes that since they have to trek through Tanzawa Pass regardless, they may as well go through with the original plan. Leland insists that their current mission should focus purely on retreat. Metphies advises Haruo that Godzilla will hunt for them anyway. Godzilla appears. Haruo futilely attacks the creature using a single-pilot craft. Unable to obtain the necessary reading to determine Godzilla’s amplified organ location without a stronger attack, Haruo prepares to fly himself directly into the monster. Leland instead sacrifices himself in a missile barrage. Resulting data reveals Godzilla’s dorsal fin as the source of its shield generator and weak point. Metphies reports to the Central Committee. With Leland dead, Metphies assumes operational command. However, Metphies surprisingly turns over his authority to Haruo. Haruo rallies everyone before assigning specific strategic tasks. The military units engage Godzilla as well as additional winged enemies. Godzilla eventually becomes trapped as planned in Tanzawa Pass. A final assault obliterates Godzilla, leaving a massive crater in the creature’s wake. Thinking about the number of years that passed, Martin theorizes that they destroyed a generational offspring of Godzilla rather than the original creature. Haruo wonders if there could be more Godzilla monsters on the planet. A violent plasma reaction shakes nearby ground. A massive Godzilla rises and is confirmed to be the original creature, having grown exponentially over millennia. From a distance, Metphies admires the monster as a godlike force of destruction. Haruo orders an emergency evacuation. However, Godzilla destroys the ships before they can escape. Everyone including Haruo is left buried in rubble. Haruo still vows revenge against the monster. Later, Haruo wakes to find himself recovering in a cave with a mysterious female. Maybe it’s my narrow Westerner worldview talking, but Godzilla and anime seem so perfectly paired for a Japanese pop culture marriage, I’m mildly surprised it hasn’t happened before “Godzilla: Planet of the Monsters.” Even the 1998 American-made “Godzilla” had its own Fox Kids animated series and Hanna-Barbera co-produced a Saturday morning “Godzilla” cartoon from 1978-1981. Godzilla’s “at last!” arrival in his native country’s chief cel-shaded form comes with both excitement and disappointment. A “Battlestar Galactica”-inspired space opera provides the excitement. Big G’s scandalously scant screen time supplies the disappointment. Ultimately, “Planet of the Monsters” impresses as a mature science-fiction epic with large-scale scope, although it undeniably underwhelms as a Godzilla-specific story. 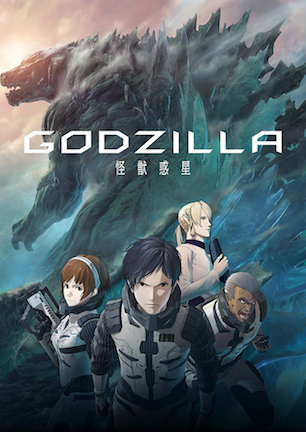 “Godzilla: Planet of the Monsters,” known in Japan as “Gojira: Kaiju Wakusei” and more succinctly translated as “Godzilla: Monster Planet,” composes the first part in a planned trilogy of anime features. Bearing in mind that the film’s secondary, perhaps even primary, purpose serves to set up Act One in a larger story, its nature as 90 minutes of excessive exposition makes some narrative sense. Taken out of that context, “Planet of the Monsters” has a harder time justifying how heavy it lays on introductions and explanations. Earth began its evolution into the titular setting during a late 20th century kaiju invasion. Following almost half a century of Godzilla-related devastation, salvation seemingly came from the stars. Two different alien races of humanoids, one aiming to expand its religious reach and the other searching for a new home, came to Earth and created a coalition to save mankind. Thinking one was referring to their species while the other was referring to their planet, I did not immediately realize that the Exif and the Bilusaludo were different races. Chalk this up to my momentarily disengaged attention or, equally possible, the movie’s habit of homogenizing characterizations to make individual personalities indistinguishable. More on this in a moment, but getting everyone and everything mentally sorted plays a particular problem in this early montage when seventy years of history are summed up in a hurry. Unfortunately, the coalition’s Mechagodzilla creation never activated for battle. Hopefully it will in the sequel. In the meantime, humans, Exif, and Bilusaludo were forced to flee Earth aboard colonization vessel Aratrum. After 20 years of wandering space in search of a habitable new home, the 4,000 remaining survivors grow increasingly despondent, as well as hungry from depleted rations. Young captain Haruo Sakaki, fueled by vengeance since witnessing his parents’ incineration in Godzilla’s atomic breath, has a bold plan to reclaim Earth from the monsters. Haruo’s status as an imprisoned mutineer doesn’t make him the most trustworthy strategist aboard Aratrum however. Exif archbishop Metphies eventually convinces the Central Committee that they’re out of other options. Reluctantly agreeing to pursue Haruo’s proposal, a battalion of soldiers and scientists reverses course to do the impossible: defeat Godzilla. Yet when they arrive back on Earth, they find that time passed thousands of years faster than it did during their interstellar travel, and Godzilla threatens to be more powerful than ever before. Much like Gareth Edwards’ 2014 film (review here), “Godzilla: Planet of the Monsters” suffers from the problem of not featuring enough of its main attraction, either the first word or the last. Godzilla’s first full-bodied appearance comes with only 30 minutes left in the runtime. The remaining monsters consist of two brief swarms of winged reptilian creatures. And much like “Shin Godzilla” did (review here), Godzilla functions more as a thematic surrogate than as a sentient character here. This incarnation of Godzilla is a purely destructive force of nature without a true personality. S/he is imposing, awesome, and fearsome, but unmotivated by any agenda other than animalistic annihilation. Circling back to a previous point, this makes “Planet of the Monsters” lackluster in terms of highlighting its supposedly central figure. Then again, the spacefaring saga built around this threat remains independently engaging. “Planet of the Monsters” features copious amounts of techspeak and other science blather of varying value. Often inconsequential dialogue detailing the nitty gritty of fungus fossilization or coordinate calculations clutters up a lot of real estate. Although even with all of this talking, the movie manages to move swiftly by using fluid, colorful visuals to provide energy that interchanges may not have. No matter what, “Planet of the Monsters” almost always looks terrific, whether ordinance is exploding in fiery clouds or officers are maneuvering fingers over holographic HUD displays. Keeping the story from digging deeper hooks into viewers are ill-defined secondary characters. Outside of Haruo and Metphies, deducing who everyone is and remembering their roles are tasks rendered impossible by character models too similar in style. Several soldiers and scientists in Haruo’s battalion have the same blonde hair, fair skin, and uniform. I had no idea a particular trio was three separate people until I looked up the roster after end credits rolled. This isn’t on the audience to perceive design subtleties. This is on the script and the voice work to inject uniqueness into each person, and that doesn’t consistently happen. “Planet of the Monsters” loads itself with commentary about demoralization, the realities of responsibility for decisions affecting numerous lives, even artificial evolution versus nature’s dominant will. The movie moves a majority of its themes thoughtfully, and in ways expressly intended for adult consumption, such as in depicting hopelessness aboard the Aratrum through one crewmember’s gunshot suicide. Surprisingly, this bleakness never bears too much weight. On the contrary, it inspires reactionary themes of courage, self-sacrifice, faith, and perseverance. A lot is at stake within the story, which in turn infuses smart subtext into the action. Not everything comes to a satisfying conclusion. One thread concerning the Central Committee having possibly exterminated geriatric citizens to purposely thin the herd earns two conspicuous mentions and little else. We have a seed planted of conspiratorial machinations, but no confirmation as to how much this matters to any plot points at hand. This sentiment encapsulates the substance of “Godzilla: Planet of the Monsters” in a nutshell. Despite being only moderately compelling as a standalone story, the film stokes considerable anticipation for a subsequent installment because of how many intriguing pieces it places on the board. An extensive amount of fiction spews forth to get straight. Now that it is, hopefully the next chapter can focus its firepower on fulfilling the promise this film exhibits for breakneck entertainment with meaningful material to mull over. A brighter spotlight on Godzilla would certainly be a plus too. January 18, 2018 by Ian Sedensky.